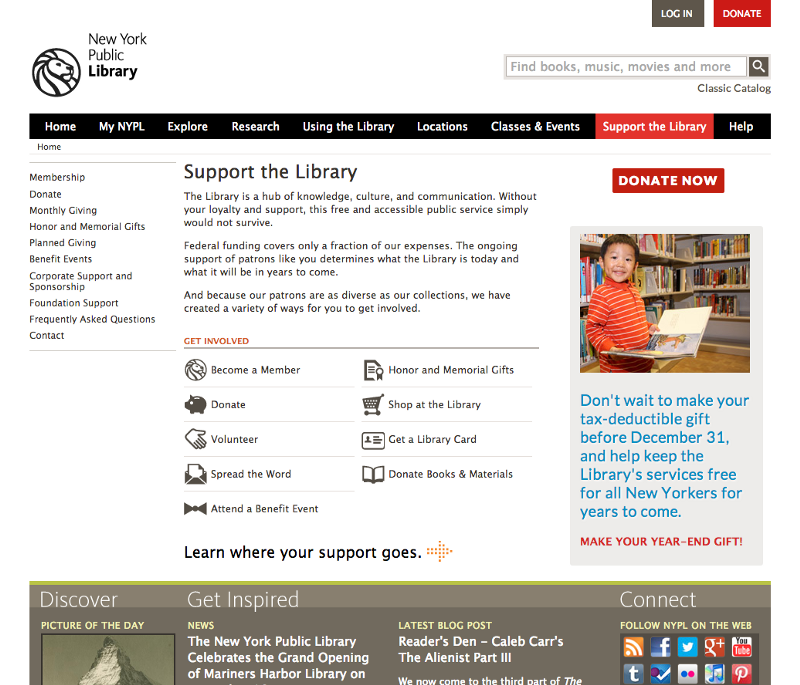 The New York Public Library’s Development department wanted to expand their section of NYPL.org to represent the variety of ways a patron can contribute to the Library. As the only UX designer at the time, I didn’t have much time to devote to this project. But I knew this area of the site could benefit a lot from even a little attention, and that our patrons were genuinely interested in giving back. If we made it easy for them to give what they could, in the way they could, we could increase not only donations to the Library but also patron engagement and investment. I worked directly with the Manager of Online Giving & Donor Acquisition. Though we were part of very different departments, we happened to sit near each other. This made it easy to have quick meetings on short notice; it also meant we had more casual interaction than if our departments had been physically separate. Proximity doesn’t automatically solve issues of time or workflow, but in this case it allowed us to get comfortable quickly and get right to work. I treated her not like a client, but like a partner. The fundraising expertise that she brought was an equal part to my web design skill, and we both had knowledge of the Library (albeit from different perspectives). Together we were able to collect business needs and translate them into a simple project brief. We then established the content priorities using strategic techniques like page tables. (My department did not have a content strategist role at the time, so such content-building tools were essential for filling in gaps.) She was not familiar with this technique and was excited to learn about it. She found it particularly helpful when she needed to go back to her team and collect content from several people. 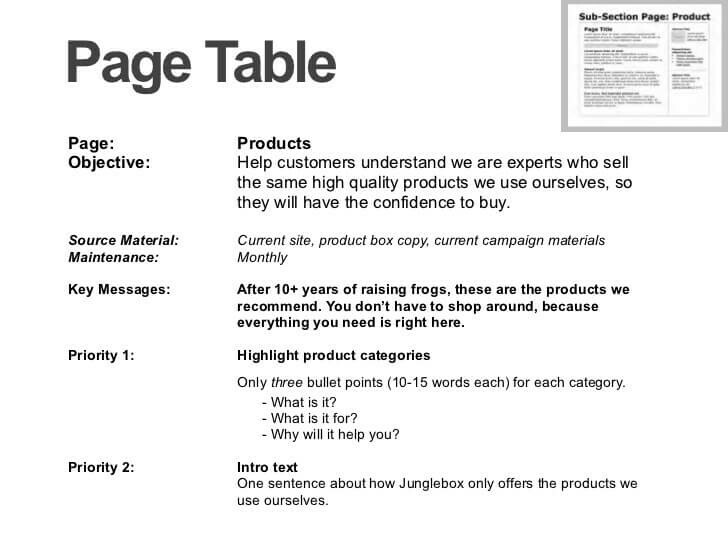 The page table structure helped them discard extraneous material and focus on expressing their business priorities. I then used wireframes to have an iterative conversation with the project stakeholders and quickly test design hypotheses before going to code. Again, this was something concrete she could share with her team and use to collect feedback. 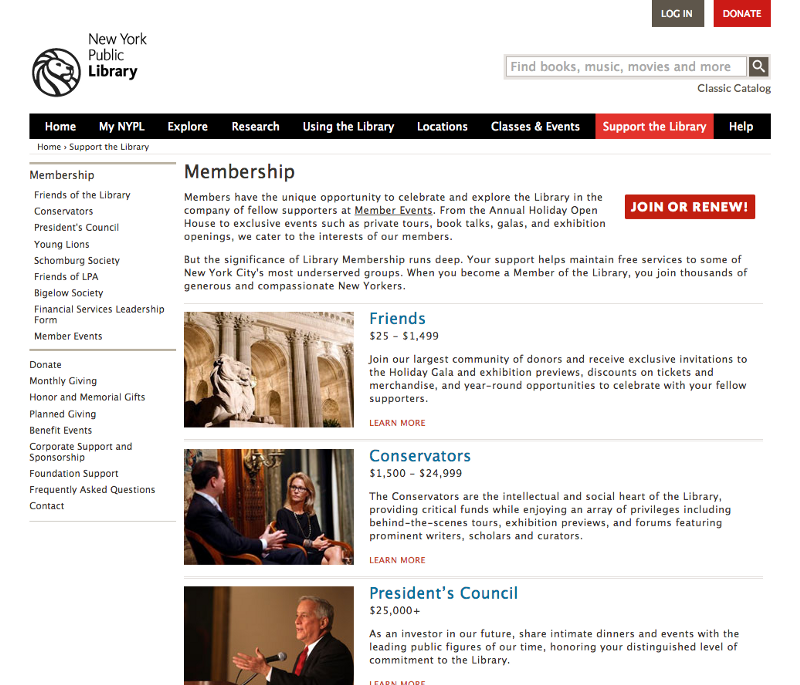 The redesigned pages resulted in a 33% increase in membership over about six months. 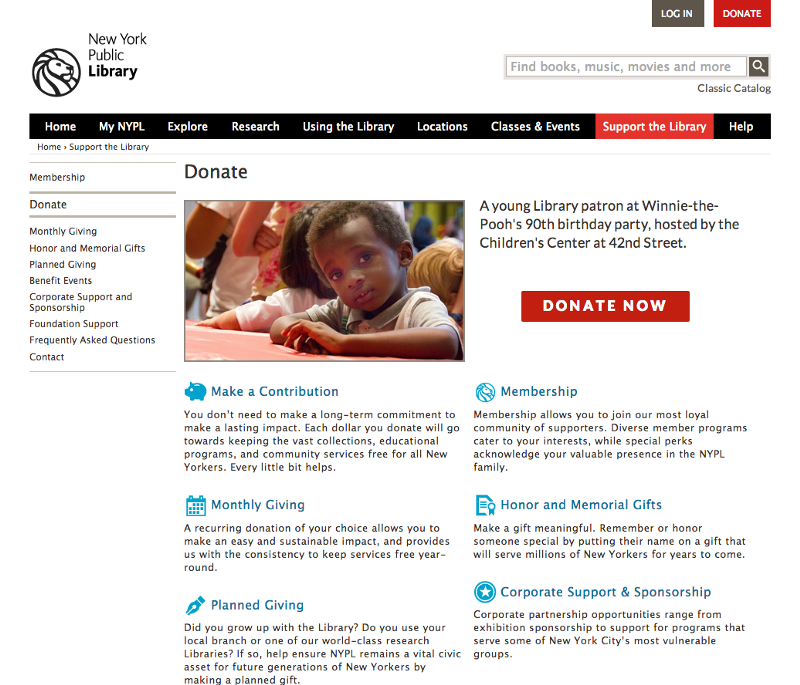 This work led to a second project, designing internal donation “ads” for various areas of the site, so that users see the connection between their support and the services the Library provides. Rather than writing a single general ad that could be deployed anywhere on the site, we identified areas of particular interest (for example, each of the research locations) and wrote copy that targeted what is special about that area. This pilot design garnered nominal improvement in terms of donations, but was valuable was to the branches by showcasing their impact. I thought of myself as a “team of one” during this project, but really I was part of a team of two. Like my challenge on the Three Faiths project, this project went well because I let my stakeholder share the design process. Sharing the creation of artifacts like page tables and wireframes let my stakeholder learn and invest in the design process, and both of us to exchange empathy for each other’s role. Dilettante, night thing, may be a replicant. Things I do well include: web/application design, bird identification, Hellboy trivia.